When Razer announced it was buying Nextbit early last year (January 30th to be precise), it marked the end of the Nextbit Robin. Released in August 2015, the Robin came with 100GB of free cloud storage in addition to the 32GB native storage on the phone. Photos and apps are automatically backed up to the cloud when the phone is in standby or on Wi-Fi. And when the amount of free storage space on the Robin dwindles to 2GB, apps not used often are sent to the cloud where they can be retrieved by tapping on the correct icon. Last August, the company announced that it was no longer backing up the Robin's warranty and would no longer handle chat and phone support for the handset. Today, the other shoe dropped with Nextbit's announcement that the Smart Saver cloud service will close on March 1st. 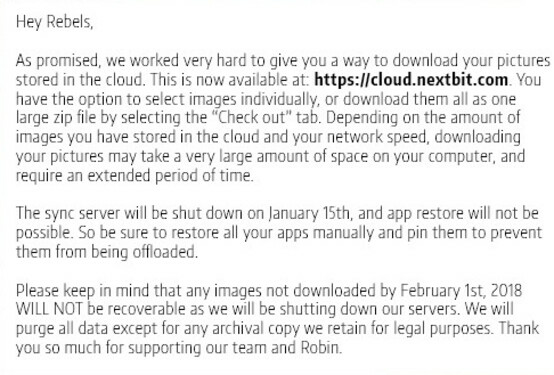 Nextbit Robin users have until April 1st to download their important files from the cloud, or lose them completely. 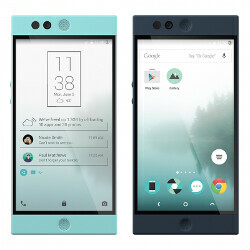 To claim your files, you need to go to www.cloud.nextbit.com. Any images in the cloud will not be recoverable after February 1st, which is when the company will pull the plug on its server. If you still have some important files and images up in the cloud, we'd suggest sending them back down to earth as soon as you can, before it is too late. So they say Jan 15th, then Feb 1st, March 1st and April 1st. Too many dates telling you damn near the same thing, to get your info off their cloud. I thought Razer buying Nextbit would prevent stuff like this from happening, but I guess not. That's why I don't trust any cloud service of any not well established, big and known company.